We would like to thank all the fathers, wives, sons and daughters who submitted photos and stories about how they love to collect with dad for Upper Deck’s “Father of the Year” promotion. Their stories are a testament to the fact that when you collect with your children, you build a bond that lasts a lifetime while helping your kids develop a love and appreciation for sports. And while every father is deserving of accolades for spending quality time with their kids collecting, we felt one submission stood out from the others that we received from Jill Kageyama. 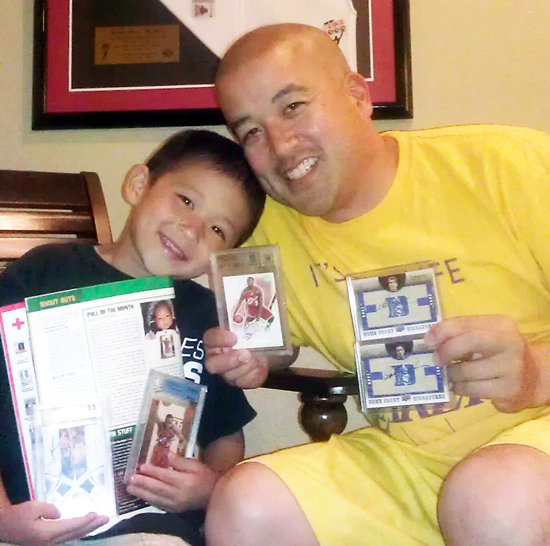 Congratulations to Eric Kageyama on being names Upper Deck’s “Father of the Year” for 2012! “A few days after Jarrett was born in 2005, his father Eric bought a single pack of Upper Deck Ultimate Collection Basketball to celebrate the birth of his son and pulled a LeBron James autographed buyback rookie jersey card limited to just ten copies. On that day, a collecting duo was born. “Every other Thursday the two go to the local card store to open a few packs and check out all the cool cards on display. While the high-end cards Dad collects will one day go to Jarrett, the common jersey and autograph cards are like gold to Jarrett. Eric and Jarrett were featured in Beckett after that rare LeBron James card was pulled. It was pretty amazing to us how unique their relationship is as it literally started right at birth and is still going strong. Here’s to many more years of collecting together for Eric and Jarrett. To help them along, Eric will be receiving six boxes of new Upper Deck products for being names Upper Deck’s first “Father of the Year!” You will also be able to find Eric and Jarrett featured on Upper Deck’s Facebook page throughout Father’s Day Weekend.